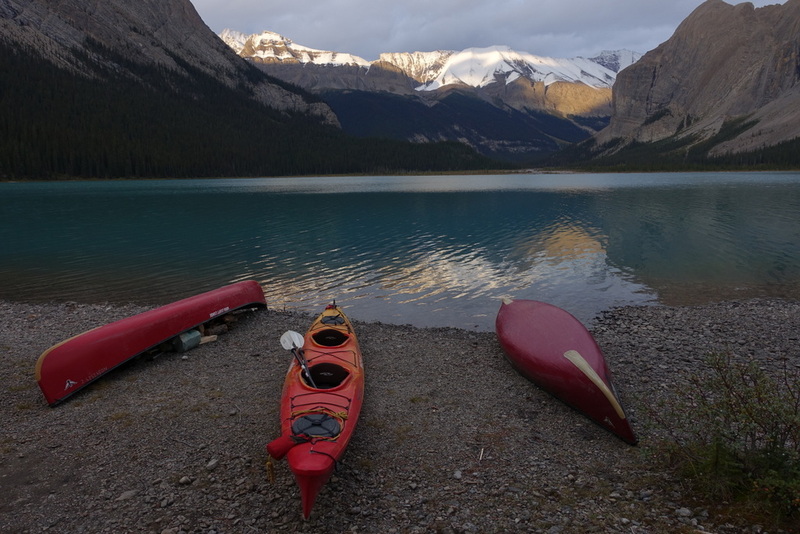 After a wonderfully relaxing time paddling Alberta’s only canoe circuit in Lakeland Provincial Park, Sil and I decided to head to Jasper’s Maligne Lake for yet more canoeing. The two couldn’t be more different! Maligne Lake is a striking turquoise colour and it’s surrounded by spectacular snowy mountains. You paddle beneath lush avalanche slopes (where you might spot a bear if you’re lucky!) and relax around campfires as you watch the sunset illuminate glaciers high above. National Geographic describes Tonquin Valley as one of the World’s top 15 hikes. We’re so lucky to have it in our own backyard. The local guidebook “Don’t Waste Your Time in the Canadian Rockies” calls it outstanding and says “not only is the valley girded by tumultuous topography, it’s broad, with enough meadowy viewpoints to allow frequent gazing – an ineffable joy on a clear day.” Some places just inspire poetic words.